Construction is underway on the $11 billion Metro Tunnel which will untangle the City Loop so more trains can run more often across Melbourne. The Metro Tunnel will create a new end-to-end rail line from Sunbury in the west to Cranbourne/Pakenham in the south-east, with high capacity trains and five new underground stations. The Metro Tunnel will create capacity on the network to enable more than a half a million additional passengers per week across Melbourne’s train network to use the rail system during the peak periods. 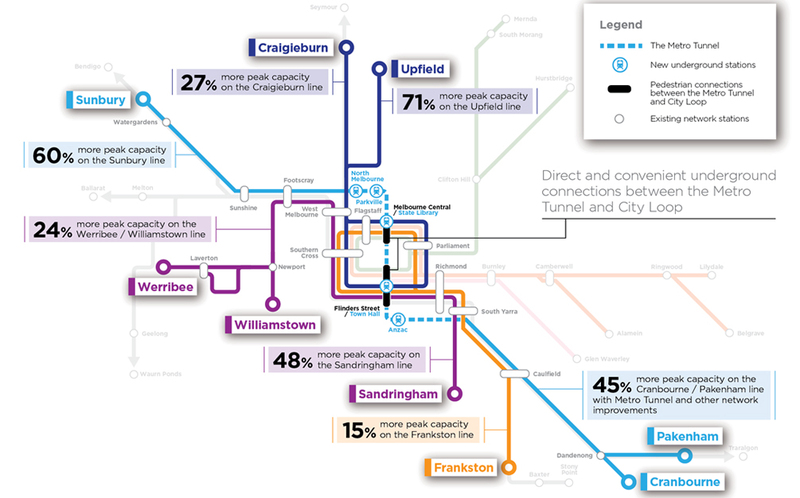 See the peak capacity increase for your train line.